Izidora Angel is a Bulgarian-born writer, translator and curator. She has written essays and critique in English and Bulgarian for the Chicago Reader, Publishing Perspectives, Drunken Boat (Anomaly), Banitza, Egoist, and others. She has edited works of fiction and nonfiction, and also worked as food critic and publishing consultant. Izidora’s full-length translation of the multiple award-winning The Same Night Awaits Us All: Diary of a Novel by Hristo Karastoyanov, was published by Open Letter in 2018 with the support of the Elizabeth Kostova Foundation. While still translating the novel, Izidora was awarded a three-week literary residency at Open Letter Books, organized by the Elizabeth Kostova Foundation, received an English PEN Grant, and a fellowship at Art OMI in upstate New York. 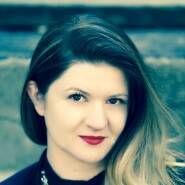 Izidora holds a BA in Politics and Sociology of Contemporary Culture from the University of East Anglia and an MBA from the American University in Bulgaria. Currently, she lives in Chicago with her husband and three daughters, and works in advertising.